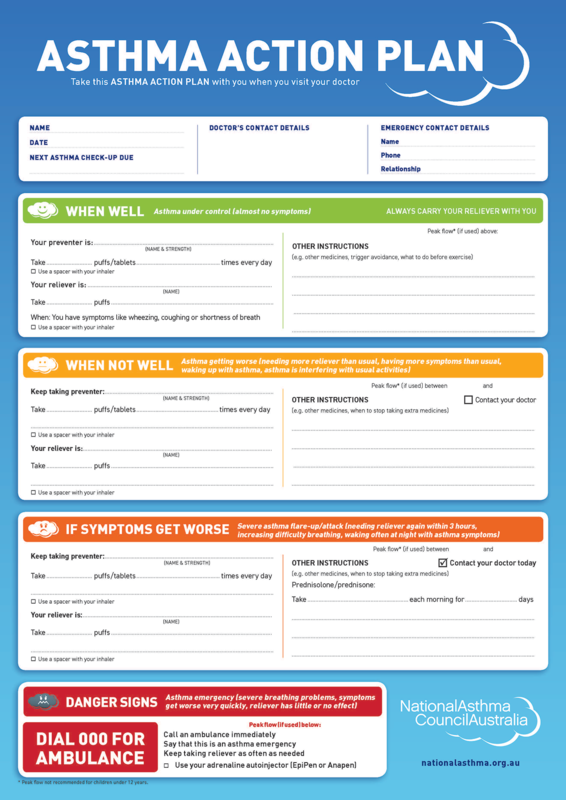 Personalised written asthma action plans show patients how to make short term changes to their treatment in response to changes in their symptoms or PEF. They also describe how and when to access medical care. Because patients are already taking maximum doses of inhaled medications, they should start a course of oral corticosteroids tablets for 10 days or return to their maximum dose if already on low dose oral corticosteroids. Encourage patients to continue to take all their prescribed inhalers and other severe asthma medications. If patients do not improve with oral corticosteroids or their symptoms worsen despite taking them, they usually need urgent medical/hospital treatment. When I feel worse [doctor and patient to agree on specific trigger points for initiating prednisolone] Make sure you are taking your prescribed dose of each inhaled medication. Asthma action plans (AAPs) need to be agreed by patient and clinician and recorded in a retrievable written or digital form to which the patent can refer when needed. Write a new or review current AAP with patient every review or flare up. Ensure the patient understands and agrees with the AAP. Supply medication prescriptions – ensure the patient always has some prednisone to keep at home. Heath professionals may find it difficult to up and download copies of action plans into some apps, so may need to keep a separate written copy in the patients file. There is a wide range of written Asthma Action Plans including ones for Aboriginal people, and some translated into common community languages on the National Asthma Council website. Asthma Action Plan presented with permissions from the National Asthma Council Australia. Discuss with the patient and their family what happens when they have to go to hospital. Recommend always calling 000 rather than getting someone to drive patient to hospital. Treatment commences in the ambulance, before the patient gets to hospital. In some states, it may be possible to register patient as “Severe Asthma Patient” with ambulance services. Ensure that the GP or Respiratory Physician details an emergency action plan explaining what symptoms are like during an asthma attack and which treatment works best. Always supply a couple of copies of this plan to patient (or take a photo of it on their phone) so they can hand it over when they get to A&E. If patients are unable to speak, recommend they use a pen and paper to communicate their asthma symptoms or use their phone to text.